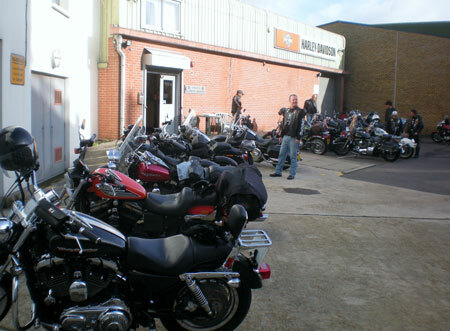 This ride was DOF’s (David O’Flaherty) idea from the start, in order to push the boundaries of the Sunday ride out. All too often you feel as though you could keep on riding long after the ‘official’ ride-out had finished for the day, well this is the one you were looking for. The plan was to meet at Warr’s on the Kings Road for coffee and croissants for a 08.30 briefing (as ever no brief no ride). 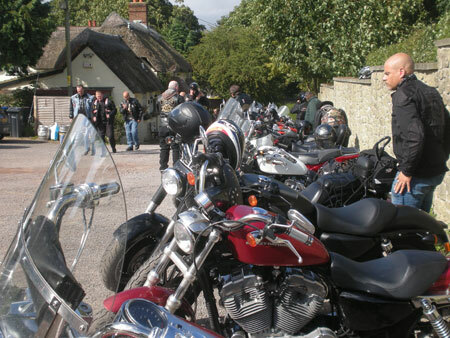 We would make an early start and ride way off into the South West for a well deserved lunch, the ride to continue in the afternoon returning to the outskirts of London in time for tea. This was to be a full days riding, expecting to cover 300+ miles depending on the weather and number of riders participating. The ride was clearly aimed at the experienced rider seeking that extra challenge, and being an official ride it qualified participants towards the C&F riders patch and Precious Metal Rockers. Like most plans, there is a huge amount going on behind the scenes to make it all appear organized and effortless on the day. The route was ridden/driven about 6 times, with a full recce/dress rehearsal the previous Sunday, when DOF and I got utterly soaked in the service of the Chapter. But we were then satisfied that the pub had the facilities we needed for lunch, and that the roads selected were a fine mix - everything from motorway standard dual carriageways to technical single track complete with grass growing down the middle. We also got the u-turns out of the way, so you didn’t have to! So off we went, the traditional route down the Kings Road and the New Kings Road to Putney Bridge and up to the A3. Drop-offs were neither needed nor expected. However, the first issue was some extremely ‘creative’ parking in the fast lane of the A3 under the New Malden interchange - two cages had collided with no apparent winner. We filtered slowly past avoiding the debris (my, those bits of BMW looked expensive) and continued south into the awakening sunshine. At Guildford we forked left onto the A31 and continued along the Hogs Back and down to the Farnham roundabout. The A287 to Odiham was unexpectedly blocked due to another ‘incident’ but we had a pleasant detour through some Surrey lanes. Once back on the correct route we quickly dispatched Basingstoke (I didn’t remember this bit at all from the recce, it was raining so hard) and set off through more picturesque back-roads until we rejoined the A303 for a quick blast to the first petrol stop at 90 miles. 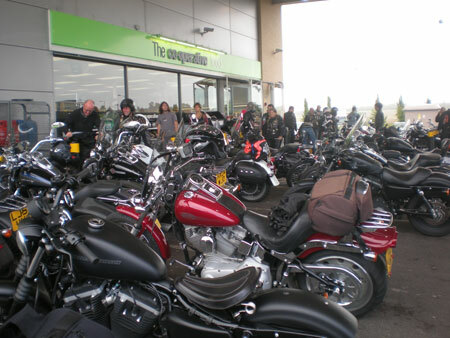 This was intended for the Sportsters but we all filled up and swamped ‘Solstice Services’ with Harleys. The opportunity was also taken to gaffer tape and tie-wrap Janet Jones windscreen back on. By this point it was once again pouring down, so on with (owned or borrowed) waterproofs, and out the back way from the services onto Salisbury Plain. The chosen route took us through the artillery training area, past barracks, ammo dumps and sad-looking parades of deserted shops. The weather almost immediately improved, the sun came out and perspiration became more of an issue than precipitation. 10 miles or so of spectacular undulations took us up to the A36 (Bath Road) where we turned left and dropped back down onto the A303. This intersection is most confusing, but only one rider went straight on. I sent the drop-off on (who was alert enough to notice not only that a rider had missed the turn, but could confirm that there was only one stray, thanks Martin) and waited for the sound of returning thunder. Out onto the dual carriageway, and we had to open up a bit in order to catch up with the others. We only went a couple of junctions along the 303 until it was time to turn off again onto the small roads, through a grand archway entrance into a park, and eventually via a short zig-zag hill up the Wiltshire Downs to lunch at the Crown Inn, a thatched 16th Century country pub. Service wasn’t the quickest (!) but the food and ale were fine and the chance to sit down and chat was welcomed. The car park wasn’t TOO gravelly. The post-prandial highlight was a trek through the New Forest, complete with ponies, donkeys, cows, sheep and pigs; the corrected route through Romsey and bypassing Winchester worked perfectly, including 3/4 of a mile on the M3, which looked extremely busy London-bound. Then we proceeded sedately up the A31, with the exception of a missed pick-up of a drop-off near Alton courtesy of a maniac coach driver, which was soon rectified (only u-turn of the day for me). 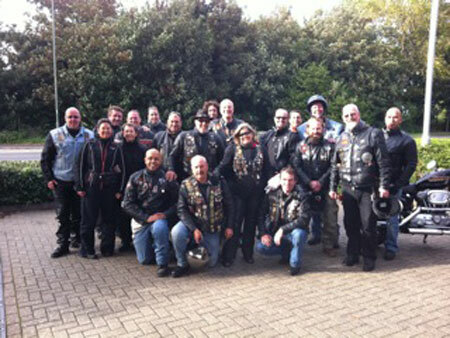 Our planned last fuel stop at the Hen and Chicken services was foiled by them having completely run out of petrol, so it was at the Farnham petrol station that the ride concluded and farewells were made. The afternoon run was dry and sunny, and enjoyed by all. So, in conclusion, don’t let anyone tell you that a Sportster is not a ‘proper Harley’ - more than half those on the run were riding Sporties, and they acquitted themselves really well, managing 100+ miles on the 12.5 litre tank, as well as looking (and sounding) a million dollars. I must say that my favourite was the new 1200 Custom with the fat front wheel and Sedona Orange/Vivid Black paintwork, a well as the eminently sensible 17.5 litre fuel tank. And if anyone has had a better day’s riding this year in better company, we’d like to hear about it!